Stephen Colbert is the host and executive producer of The Colbert Report, an Emmy and Peabody Award-winning series on Comedy Central. Touted by The New York Times as “one of the best television shows of the year” and praised by Entertainment Weekly as “the best show of the year,” the program has garnered ratings and critical acclaim since its 2005 launch. Before the success of his own program, Colbert was the much-beloved and longest-tenured correspondent on The Daily Show with Jon Stewart. His performance career began in Chicago with the famed Second City improv troupe and has spanned sketch comedy, television drama, animated film and live-action narrative. In 2006, Colbert was named one of Time Magazine’s “100 Most Influential People.” His 2007 book, I Am America (And So Can You! ), reached number one on The New York Times Best Seller List. 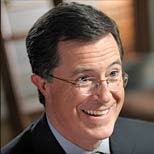 Born in Washington, DC and raised near Charleston, South Carolina, Colbert graduated from Northwestern University. His Irish ancestors immigrated to the U.S. throughout the 19th century. Stephen’s great-great-grandfather, Michael Garin, arrived with the massive wave triggered by Ireland’s Great Famine, but a number of his ancestors came earlier still. Colbert’s German ancestors arrived in the American colonies in the mid-18th century. The youngest of eleven children, he now lives with his wife Evelyn and their three children in the New York metropolitan area.